Don't let desk clutter ruin your workstation. Organize desktop items and store your small to medium sized accessories in the Small Half Circle Drawer from UPLIFT Desk. 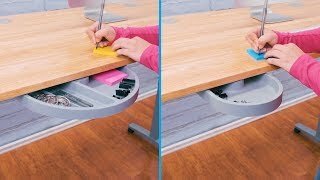 The 360° rotating drawer installs neatly under your desk via a central mounting system, increasing storage space where it was lacking before, and preserving the clean look of your workstation. Swivel open and swivel it back closed again - it's like a disappearing drawer that stores your pens, sticky notes, and even sunglasses, for a more organized worksurface. When you need sleek and optimized storage at your desk, the UPLIFT Small Half Circle Drawer is here. Want a little more space? The UPLIFT Half Circle Desk Drawer features a similar design, with a few added inches of storage space. What if I need more space? Is there a larger drawer? Like the small half-circle drawer but need more space? The UPLIFT Half-Circle Desk Drawer features a few extra inches of space for storage where you need it. The Small Half Circle Desk Drawer by UPLIFT Desk is available in a trio of colors: black, gray, or white. Match your frame and desk accessories for a coordinated look that you and your coworkers will love.